Intro: Are you cut out for it? My name is Ken LaVoie, owner of LaVoie's Landscape Mgmt. 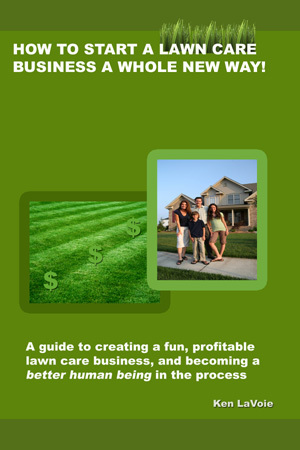 Inc. and author of this guide on starting a lawn care business. This book (and optional add-on package) is based on the knowledge and lessons I've accumulated over twenty-eight years in the lawn care and landscaping business. I will do my best to teach you how to start a profitable lawn care business or improve your excising one. My goal is to give you what you need to create a great little business and earn a respectable income with benefits. I take pride in this material: I've put my name on it, and I stand by it with a 6-month money-back guarantee. If you don't feel it's delivered enough value to you, I don't want you to pay for it. Credible, time-tested information from nearly three decades in the green industry: I use all these techniques in my own lawn care business and I know firsthand that they work. You can avoid some common mistakes you might make otherwise. What's the difference between the book and the whole package? Our eBook Book / Guide"How to start a lawn care business a whole NEW way" complete with tips on what equipment to buy, how to use it, tips on office setup, finances, marketing, with a "how to" section for each task. Also included is a resources list that can save you alot of trial and error. A dozen or so letters to send clients: price increase, "welcome back", etc. I won't try to put a value on any of this, but I would conservatively say that any one or two of these items is worth the price of the entire package.